My sister is a teacher too. And she’s smart. And sometimes she poses questions which stump me. She posed a good physics problem on Facebook a while ago. In case you can’t tell, the three fixed, point masses have masses 1, 4, and 9. She wants to know where you can place a mass so that it won’t move! So that the net gravitational force on it is nil. Before starting, I thought this problem would be so easy. 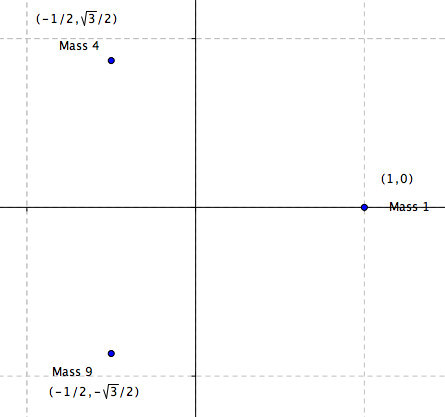 If the three masses were equal, we’d have a simple geometry problem. Since they aren’t, it turns out we have something more tricky. I thought the solution would come easy. For me, it didn’t. But I think I got an approximate solution. As you can tell, I placed the three points on the unit circle. I don’t want to give much away, so I’m just going to leave you to it. Throw your thoughts in the comments below. If you’re dying for the answer, I’ve hidden what I got on this site somewhere in some not-hard-to-find spot. If you get stuck, look after the jump for some encouragement. Just a note: I don’t know if I got the right answer… I think I did, when checking it, but I’m not totally sure. I got tired of working it. That’s why I wanted to throw this up there to see if anyone could corroborate, and also to see your approaches! Okay, so you’re here because you’re stuck. Here’s some encouragement. I was able to write a couple of equations (net force in the x and y directions) and had to solve them simultaneously (set them both equal to 0). They were ugly. I used a computer. Yeah? Yeah? So what! So sue me! Things didn’t go elegantly for me. I went brute force. I never said this problem had a beautiful solution. Hey, I didn’t even come up with the blasted problem! But I generated this really pretty image in the course of my investigation. I found the center of mass too, when I first did the problem. However, the center of mass is not the same as where the gravitational force is zero, I don’t think, because the gravitational force reduces as the *square* of the distance from an object. The center of mass calculation never takes that in account. 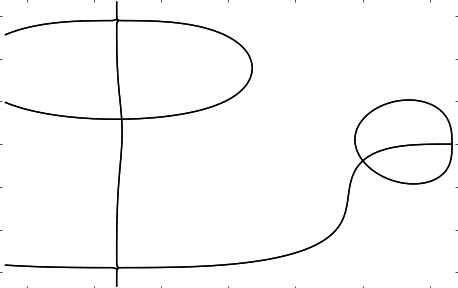 One thing that suggests that it isn’t the center of mass: you can imagine a configuration of masses such that there are multiple places where the net gravitational force is zero. But center of mass will always just give you ONE point, no matter the configuration. Someone out there, am I wrong about this? I’ve definitely confused myself on this problem. So I too am willing to be instructed. So this sister of yours…Is she in the blogging circle and the two of you aren’t admitting relations? If not, why haven’t you convinced her to join yet? I want more of her insights. You’re telling ME! She is such a good teacher that I keep on trying to convince her to blog… Maybe I’ll ask her if she wants to do a guest blog post at some point! She has tons of great ideas. Hooray! Those are the values I got. Now that enough time has passed, that everyone who wanted to might have tried their hand at it, could you say how you got your answer? Where/when/how did you use a calculator/computer, and what equations did you use? Please check out http://shuisman.com/?p=437 ! If typed the solution along with Mathematica code to reproduce the plots and results. You are awesome for posting that. The pictures are so pretty! I might just have to make this a multivariable calculus problem set problem next year, where students will have to use SAGE (or some utility like it) to solve.